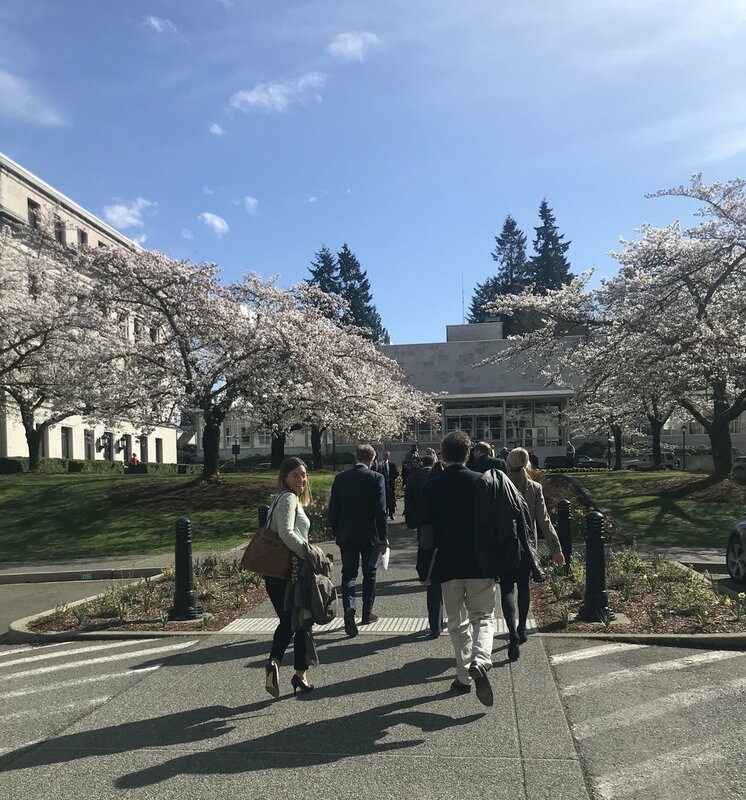 Last week, members of our Board of Trustees and Leadership Council trekked to the Capitol in Olympia to meet with Governor Inslee, members of our state Legislature and Commissioner of Public Lands Hilary Franz. 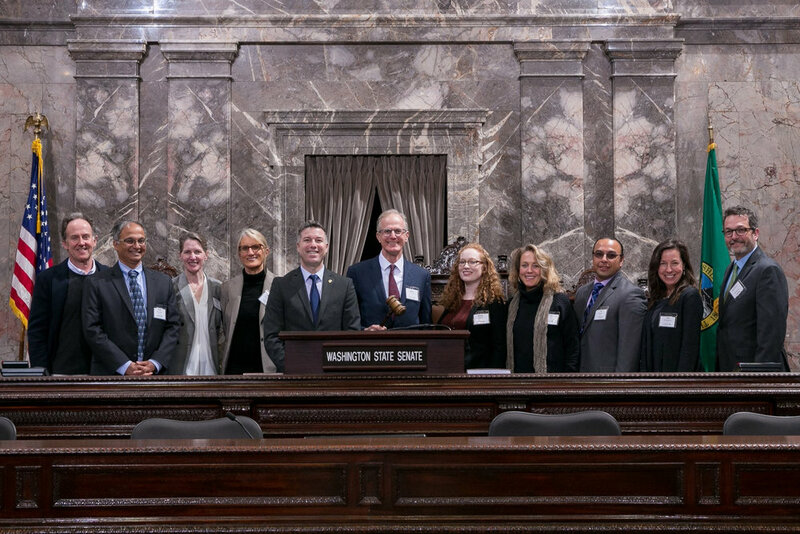 Conservancy staff and trustees joined Sen. Brad Hawkins (R-12) on the Senate floor following a meeting focused on forest health in Washington. Photo courtesy Office of Senator Hawkins. As volunteer leaders with The Nature Conservancy, our Trustees and Leadership Council members are passionate about creating a better world for people and nature. They know much can be accomplished through advocating for strong conservation funding and smart policies to make our state more resilient in the face of a changing climate, to clean up our waterways and the iconic species that depend on them and to address a forest health crisis that threatens our communities with wildfire each year. Trustees (from left) TJ Greene, Diani Taylor and Martha Kongsgaard listen during a meeting with Governor Inslee as Washington State Director Mike Stevens makes a note. Photo courtesy Office of the Governor. Community forests and bold investments in the health and resilience of our forests and the communities that depend on them, including wildfire prevention and suppression, restorative thinning and prescribed burning. We underscored our message with an OpEd in the Seattle Times by our Forest Partnerships Manager, Darcy Batura, and Kevin Curfman of the Washington Contract Firefighters Association. Puget Sound restoration and emergency action to save our iconic Orca, including cleaning up polluted stormwater runoff before it enters our waterways, increasing Chinook salmon abundance and restoring fish and wildlife habitat in the Puget Sound basin. We ended our day with a reception with legislators and Commissioner of Public Lands Hilary Franz, where trustees, lawmakers and staff dived deeper into forest health needs and explored natural solutions to climate challenges facing our state and our region. Check out a few snapshots from our day on the Hill, and consider contacting your legislators to speak up for nature this session, too! The legislative session is scheduled to run through April 28.